2/27/11 Bottled 8.5 cases of barrel SG4 and used the rest of the barrel in 2010 blends. 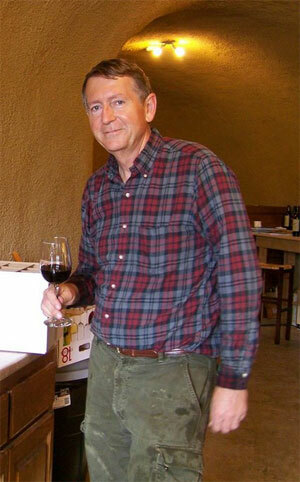 See 2010 winemaker's report for details. 2/20/11 Bottled Barrel Q3 26 cases + 1 bottle or 313 bottles. Mike Roy helped. Barrel SG4 remains. The plan is to bottle about half of SG4 and blend the rest in with the 2010 to get the alcohol levels up on some of the 2010. 2/19/11 Bottled Barrel Q1 26 cases minus 3 bottles or 309 bottles. James Konrad helped. 12/5/10 In preparation for bottling the rest of the 2008 vintage to make room for the 2010 vintage I did wine analysis of the 2008 wines as shown in the table below. Barrel Wine T.A. pH Alcohol % by vol. The big surprise here is the alcohol content of SG4. By serendipity including forgetting to press tank C which contained this wine this wine didn't get analyzed with the rest of the lots post press and as a result I was unaware of the high alcohol until this measurement. It makes me feel justified in doing this final measurement. In looking more closely at my winemaker's log book there was evidence of this high alcohol along the way. First it showed up as an 1117 specific gravity in tank C which must have produced a wine with 17.4% alcohol to produce the 16.5% alcohol wine in SG4 aft4er blending with the 15.2% alcohol wine in tank B. I also noted that this tank had the thickest must of any tank which was also a hint. There is also a note that it came from the bottom of block 3 the ripest area of the vineyard every year, another hint. A 12/28/08 post press tasting of tank C while it was likely over 17% alcohol produced the comment "very bitter start to finish". My own tasting notes on 11/24/10 which was after the blending with tank B to reduce the alcohol to 16.5 % are that SG4 was "somewhat hot with little oak". Most notable above is that the 2008 Camalie cab. ranked at the top. It is unclear whether this is the 16.5% alcohol 2008 cab from barrel Q1 or the half barrel C2 but since Q1 ranked over C2 in the 7/18 tasting it is probably safe to say that we would have liked the high alcohol cab even if it isn't what we tasted in this tasting. 11/14/09 We were fortunate to have Marketta Formeau visit on this day pressing the last of the 2009 vintage. She tasted the Carmenere from 2007 and 2008 and identified that the 2007 Carmenere is somewhat overoaked now and should definitely be bottled immediately. She also did a little blending experiment and showed us that a 15% addition of the 2007 to the 2008 would improve the 08 Carmenere significantly and make it ready for bottling which she recommended to capture the fruit that the 08 still has. 7/18/09 We did a tasting of all the 2007 and 2008 wines along with some 2005 and commercial wines. 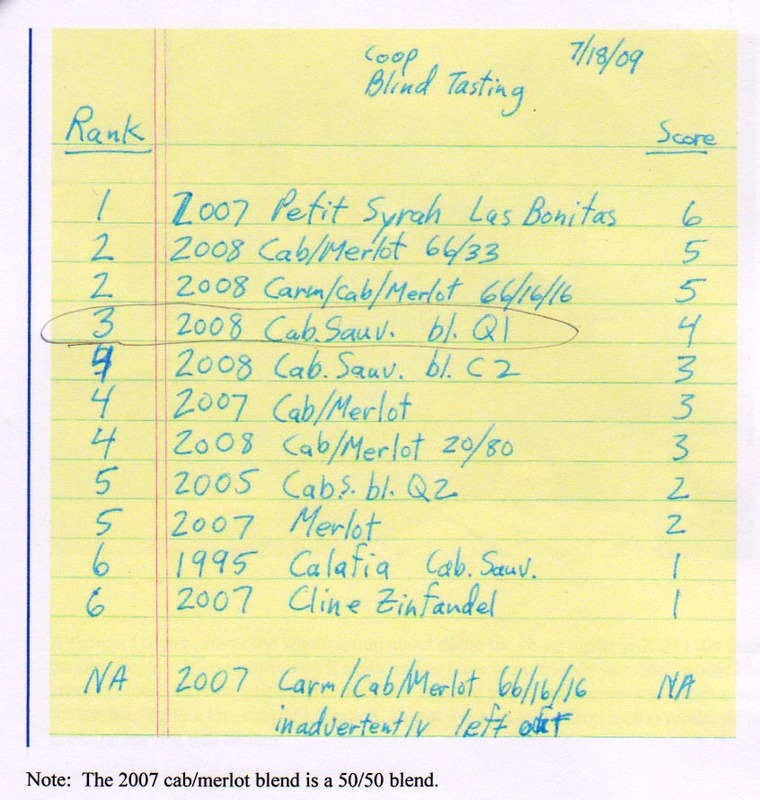 Of note here is that the High alcohol 2008 cab ranked highly. On January 10, 2009 we tasted the 2008 vintage along with 6 commercial wines. We in this case was Anni Tilt (cold) David Arkin, Adam Koplan, Mark Holler and Cindy Bickerstaff. You can see our respective scores below. We expanded the scoring scale to include double pluses and minuses to give the final scores more differentiation. 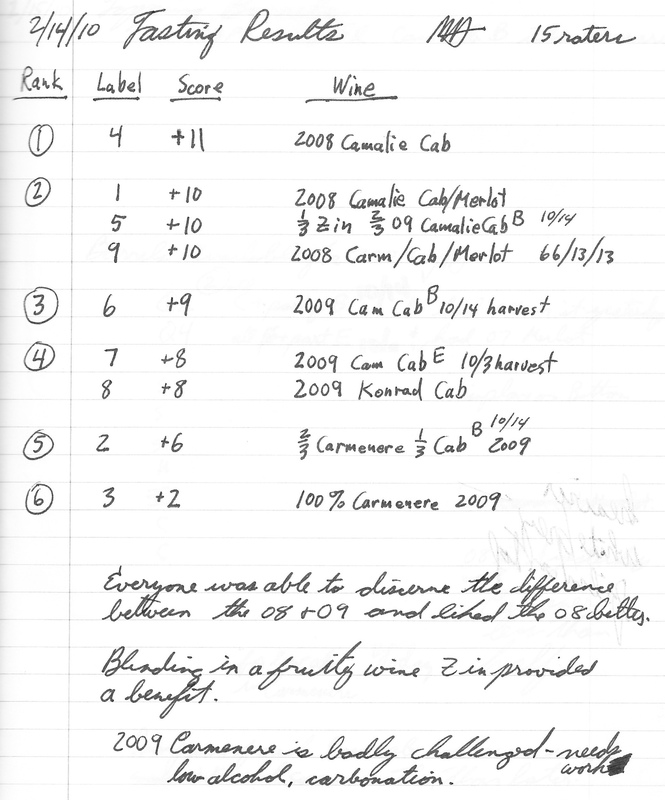 Interesting results were that the Niebaum Coppola 2001 Cab ranked highest all by itself. This has been a good wine for some time. Thanks to Tracy for enabling us to buy a bunch of it at discount. The Rubicon estate Syrah was next best and surprisingly our 2008 Cab/Merlot 50/50 blend tied with it. We decided to make a barrel of this blend for sure. Our Merlot came in 3rd tied with Sinsky's Red and our Camalie 2002 old vine Cab. The rest of our cabs came in 4th, 5th and 6th. the Sherwin Family Vineyards Cab had some unusual problem. The Carmenere ranked at the bottom this year after ranking in the top few last year and no one liked the Malbec much either. The weather was quite warm and we had a record perigee full moon which lit up the outdoors like daylight. Moved Carmenere in tank A to tank B to get it off of the lies. Moved the rest of tank D cab, 31 gal. went into tank A off of lies. Moved ~30 gal. Cab from tank A into half barrel C2 used barrel from 2006. All this oak has been used for 2 years previously. C3PO actually was used 4 years in the 04 and 06 vintages. It produced Neon. There is a total of about 242 gallons of wine at the moment and we can expect 5-10% to be lost when we rack the wine off of the lies which means we will have about 225 gallons of wine to put into the barrels which is about 3 1/2 barrels of wine plus some topping. We currently have 7 full size barrels used once available for use and two quarter barrels and two half barrels as well if we wait for the 2006 to be bottled which should happen in the next 3-6 months. Overall this wine is coming along very nicely. It should be one of our best vintages yet. Next step is the barrel mix tasting in January. 11/23/08 Innoculated all tanks for Malo-Lactic Fermentation. Total wine volume is now 241.8 gallons. Expect about a 10% yield loss at racking to barrels. 11/23/08 Diluted Merlot to get alcohol level down( 17.2%->15.5%) and enable M.L. to work. Added 7.5 gallons (11.5%) of Arrowhead springwater to 66 gallons of Merlot in tank F. Note that this wine was already diluted 13% at crush! Total dilution 25%. Still plenty of intensity and color in this wine. 11/21/08 Pressed Cab in tank C. Wonderful fruity nose, Strong tea flavor nice, moderate astringency, nice. 11/16/08 Blended 2.75 gallons of Merlot(F) and 2.75 gallons of Cab (E) into the Carmenere in Tank A to increase its alcohol level, reduce spoilage probability. 17.5 gallons of Carmenere Cab Blend after this. more astringency, hot, young cab fruit no veg. very hot, bitter finish, needs dilution. 11/15/08 Pressed Carmenere in tank A and Cab in Tank B. Forgot to press tank C.
10/24/08 Pressed Cab in tanks D and E.
10/19/08 Pressed Merlot in tanks F and G. 69.2 gallons. M.H. by myself. 10/11/08 Carmenere and Cab Last Harvest. B Cab. Sauv. 57 gal. 1100(11gal. partially fermented) 27.2(pre-mix) 54 gal. Added 46 gal. Cab to 11 gal. of Cab in tank B already fermenting for one week. 28g tartaric added to B, none to the Cab. Total Carmenere weight about 145 lbs. less than 1 lb/vine. Tank Vol. Brix S.G. pH T.A. No dilution of the Cab but, added .5g/l tartaric. T.A.s on juice settled overnight, pre sulfite addition. Acid adjusted up .5g/l but no dilution. Some great Photos of all the fun. 9/13/08 Merlot Harvest and Crush of about 890 lbs, off 35% from 2007. Total 81 gal. 93 gal. Conservative dilutions made. Expect alcohol to be high. Ferment ended cleanly, Peak temp 80F, no sulfides, 992, 995 S.G. on 10/12/08. Low S.G. is probably sign of high alcohol. alc. S.G. =.7xx Added significant yeast nutrients to all fermentations. Added acid targeting 5.0g/l finished. Included extra to compensate for dilutions.